My club is starting to get to grips with Chain of Command, and this was to be my first time rolling out my elite German Panzergreandiers against Phil’s elite British Airborne. Neither of us have much support painted up yet, so we opted for a Patrol game. Reece and Simon joined us to learn the ropes and assisted on the British and German side respectively. The lovely terrain seen below is Phil’s. The Brits rolled 11 for force morale, the Germans 10. Curses, we were behind already! Victory conditions were to reduce the opponent’s morale low enough to force a withdrawal. The patrol phase kicked off with the Brits spreading their markers in line abreast, while the Germans kept them together and pushed up in a tight group. Our intention was to get a JoP as far up in the woods as possible and send a squad up to take the white house by the woods, allowing us to enfilade the British line. I feel we got the better of the patrol phase, getting a marker into both the treeline of the woods and the ruined farm in the centre, with another moving out to our left. Seeing they had made as much ground as they were going to Phil wisely moved his last marker into lockdown to prevent me from moving one around his flank and restricting his JoP placement zones. Note that all moves of patrol markers were IGoUGo, the appearance of multiple moves by one side in the slide show above is for the sake of brevity. British JoPs (blue) form a line at the top, Germans ones (red) range from centre right to bottom left. The British JoPs ended up behind the road and hedges, while the Germans put one in the woods, one in the ruined farm, and Simon cunningly suggested we put our third quite deep and on the flank. Besides giving us a fallback position this would allow us to deploy troops covering the flank of the farm in the centre. Our plan was to pin the British in the centre and deliver a right hook from one (or hopefully two!) sections. The Brits started well, rolling double sixes and enough dice to bring on all three sections, which they promptly did. The Para weapon section contains two strong Bren teams. The white house in the background is the one that the Germans wanted to get their troops into. 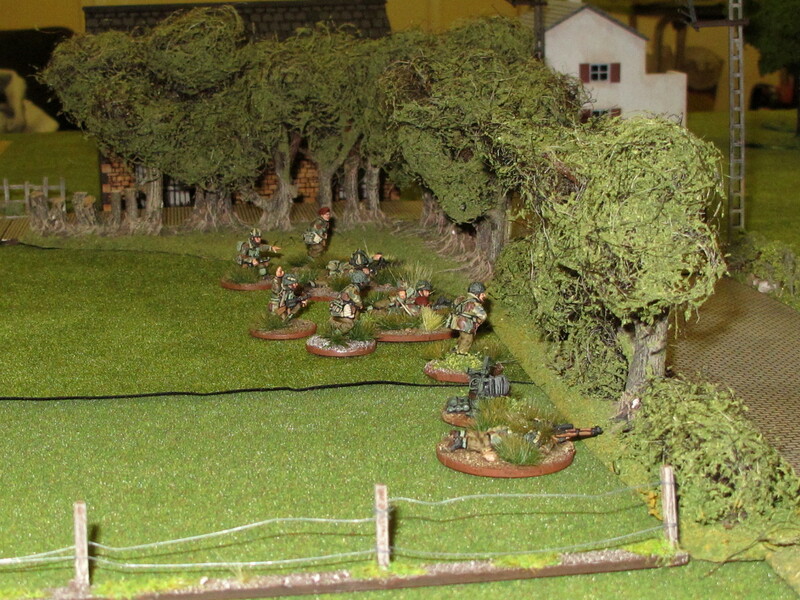 With nothing to shoot at yet, the Paras advanced through the hedges and across the road. 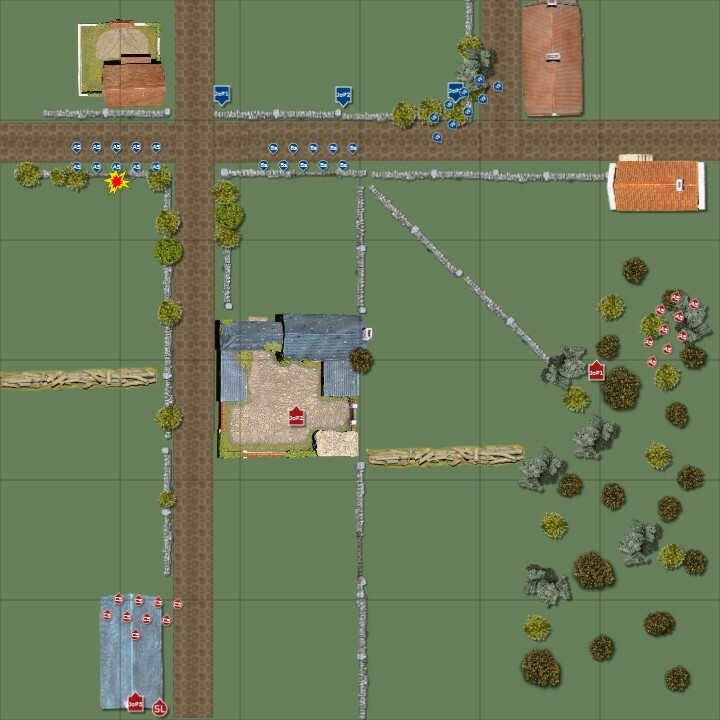 The command dice blunted the German reply somewhat, allowing only one section to deploy into the woods and the platoon CO to park up behind a barn at the rearmost JoP. The British continued to take up positions along the road, but still had no targets as the Germans in the woods were out of sight. In the next German phase a second section deployed into the barn near the German baseline and opened up on the British section moving to flank the ruined farm. Germans in the barn at lower left open hostilities by putting some shock on a British section. The British returned fire, killing a German. At this range the elite status of both sides made getting hits very difficult for both sides. The 2″ mortar had been brought up and it immediately went to work trying to screen the Germans in the barn, so that the flanking move on the farm (and its undefended German JoP) could resume. Accuracy however was initially less than stellar! The Panzergrenadiers tasked with taking the white house continued to advance through the woods, but had to be careful crossing the small gap between the trees and the building. Luckily no British troops were on overwatch covering that gap, or the dash to the house would have been suicide! Meanwhile the German CO rallied some shock off the other section and it resumed firing against the Brits with limited success. The two Germans sections are widely separated, but the British haven’t moved to isolate either yet. The light mortar started to find the range and promptly dropped smoke directly in front of the windows on the barn, neutralising the German MGs there. 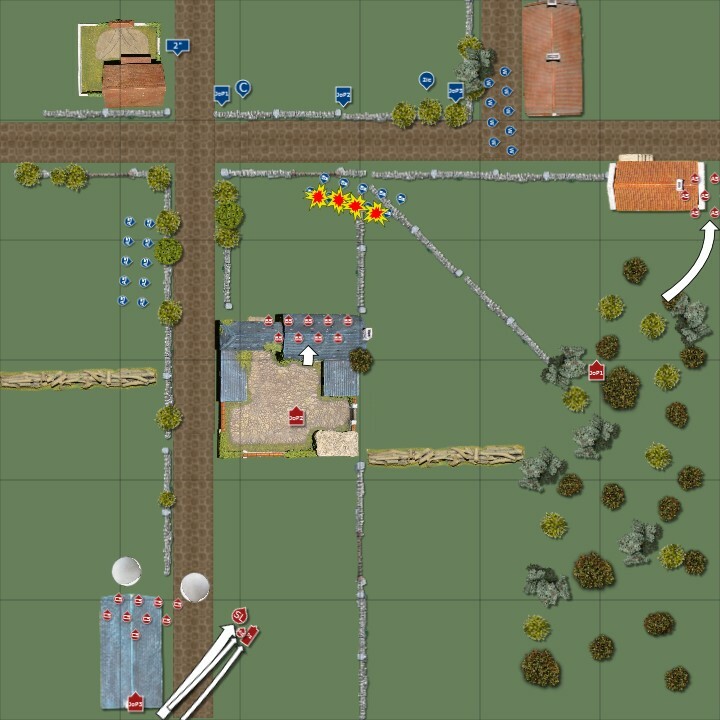 Seizing the initiative both rifle sections move towards the farm, with the one on the British right trusting the smoke to protect them as they move into the open. Unfortunately for the Paras the Germans by now had a complete Chain of Command dice and so would be able to end the turn, dismissing the smokescreens protecting the British advance. From his position at the rear JoP the German CO plays his trump card. The panzerschreck team with him would be little more than meat shields in this game. Sensing that the Paras had made a mistake the German officer ordered his last remaining section into action, deploying into the ruined farm and letting rip with two MG42 teams at the British rifle section in the open to their front. 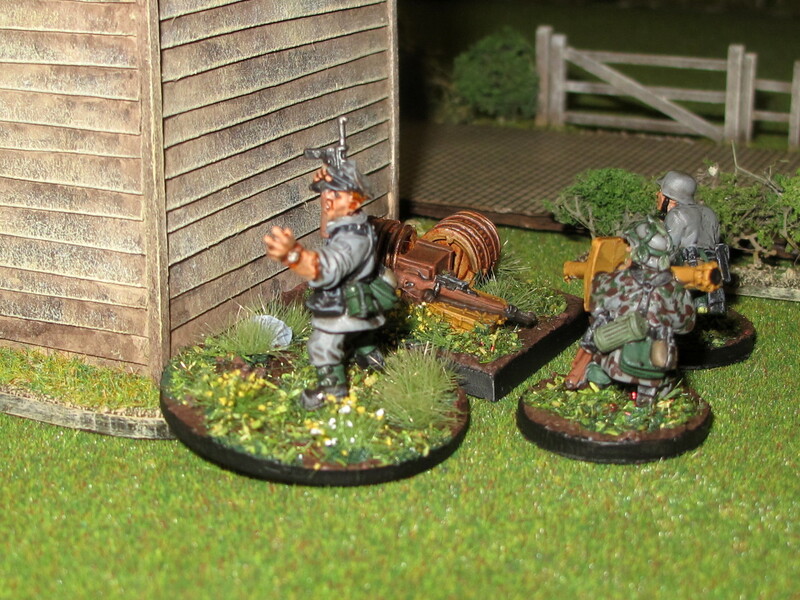 Two tommies fell and their corporal was wounded, knocking British force morale down to 10. The last German section springs a nasty surprise on the Paras in the open to their front, while their CO moves up to support them. In reply the British start throwing smoke at the front of the farm, to try to dial down the hurt from the Germans deployed there. Return fire is hefty, but hard cover prevents it from having much effect. The other rifle section caught in the open on the British right rolls too low to get out of the field they’re in. In better news their weapons section, which had been crawling along finally starts getting into position in the building next to the one the flanking German force is heading for. The British now find their advance has exposed both their rifle sections. Before the Germans in the barn can rip into the flank of the exposed British section Phil cleverly played a Chain of Command dice and interrupted the German phase. His section neatly hopped over the hedge, cutting the number of Germans in the barn who could hit them in half. Unfortunately the defenders in the farmhouse could now see them, and the section took a battering. Already carrying some shock their junior leader now took a wound, further damaging British morale. 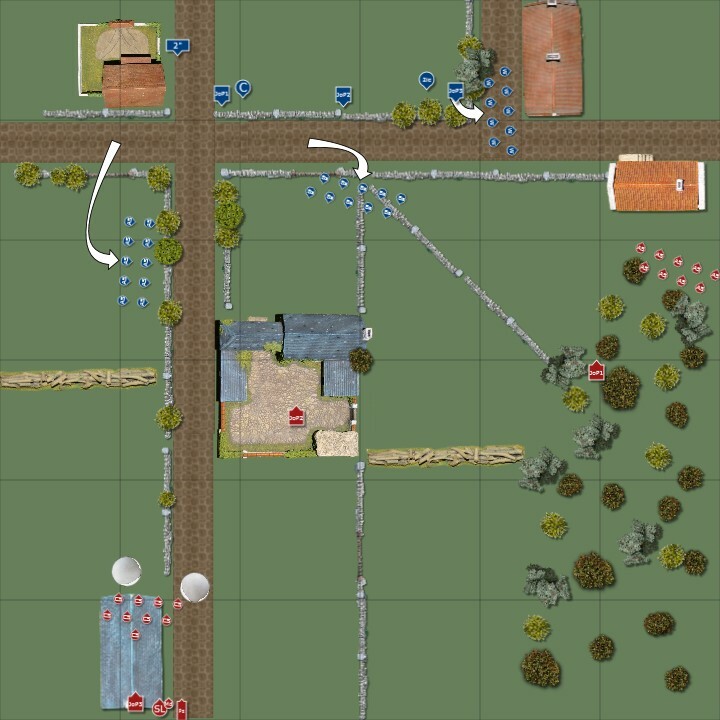 Although it was the German phase the British player used a Chain of Command dice to activate his rifle section and move them somewhat out of the line of fire. 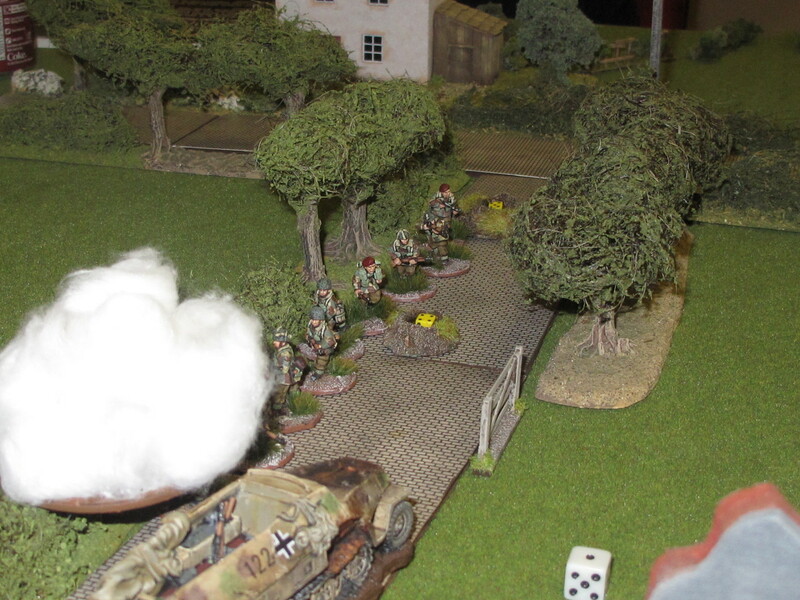 Caught between two German sections the Paras are unable to find decent cover and take a beating in the road. Note the yellow dice counting shock on the teams. These lads are in trouble! 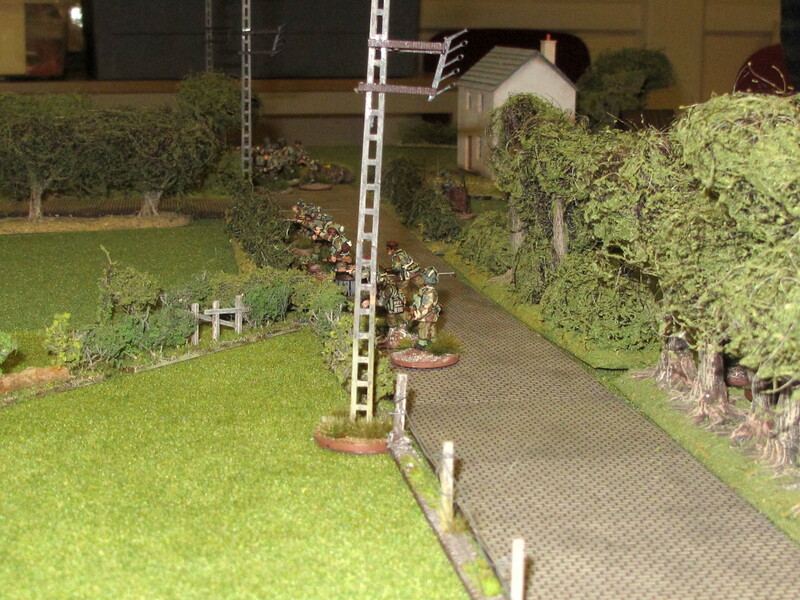 The rifle team caught in the open in the centre took further hits and was wiped out, leaving only the Junior Leader in the field and their Bren team lurking back in the hedge. British morale was now dropping rapidly! Being caught in the open, both British rifle sections are getting slammed by two German sections. At the top right the German section in the house begins to trade fire with the British weapons section in the house over the road. By now it was clear to the Brits that their two rifle sections were done. One had lost its entire rifle team, and the lone JL who had urged them forward was soon cut down where he stood by an MG. British force morale was now at six, with the Germans still on their starting ten. The rifle section in the road had only take one casualty, but their corporal had been wounded twice and their level of shock was close to pinning them. The shock meant they couldn’t move to fall back, their JL couldn’t rally them and their nearby SL couldn’t help from where he was as they were in sight of the enemy. At this point Phil and Reece decided their position was untenable and opted to withdraw. A German victory! A Bren team trading fire with the Germans in the white house across the road. They say timing is everything, and this game proved it. The British thought they had closed down the German fields of fire by dropping smoke, but the intervention of a CoC dice cleared all their protection at the exact moment they had two sections in the open. Facing two German sections packing no less than four MGs it didn’t take the Germans long to shoot both sections to bits. British casualties weren’t high, but their platoon had been rendered unable to continue the fight, which is a hallmark of Chain of Command. I feel the Germans had the edge in the patrol phase, and used it to get all three JoPs into good positions. Two out of three German sections never moved, as they deployed straight into positions that really stuck it to the advancing Brits. By contrast the British JoPs were clustered together. This meant that they were mutually supporting, and the British SLs found it easy to activate everything. Conversely the Germans weren’t able to activate everything in some phases, but as it turned out were able to scrape together enough command and control to pull off an effective battle plan. The German panzergrenadier sections have plenty of firepower, and you just can’t allow yourself to be taken in the open by them. Don’t rely on smoke to protect risky moves if your opponent has a CoC dice in hand. Never move across open ground towards a JoP if the enemy has units in reserve. Tactical movement is safer, but will prolong your exposure. Further to the above, an important JoP can be well protected by holding its defenders in reserve until the last-minute. This prevents the enemy from putting shock and casualties on them. Attackers can use covering fire on likely deployment positions near JoPs to mitigate this. Troops deployed in hard cover with a Senior Leader in support are extremely hard to dislodge with small arms fire. HE works a lot better. If playing a CoC dice to end the turn, do it towards the end of your opponent’s phase. I made a mistake by playing it in my own phase, which meant the smoke was still in play during my phase. Obvious stuff maybe, and it’s probably our inexperience showing. What would I have done differently if I was the Brits? Probably focussed my attack through the woods on the left where they might have been able to rush the German JoP there. 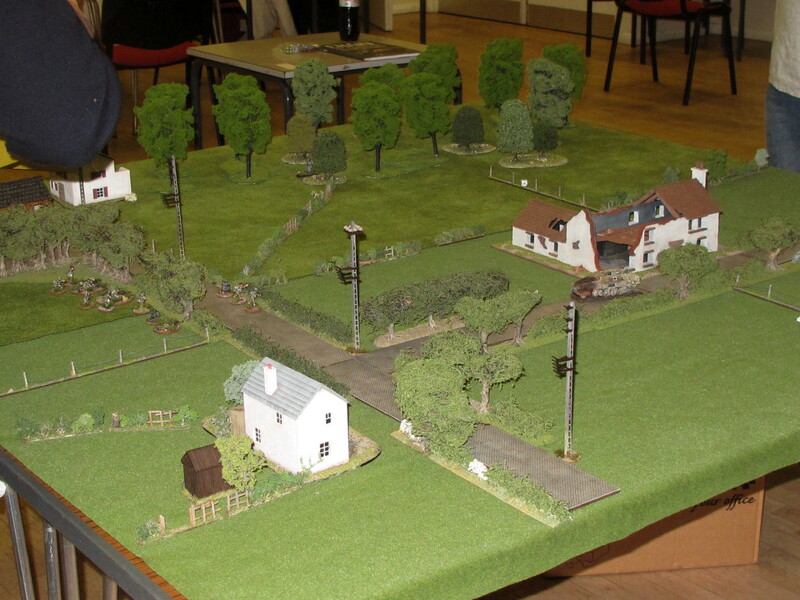 Maybe use the weapon section to fix the Germans in the centre and send both rifle sections through the trees. If I’d wanted to go along the axis they chose (up the road and fields either side) I probably would have broken up the weapon section, giving an extra Bren to support the rifle sections and left one Bren to provide flank security. I would definitely have used overwatch to stop the Germans in the woods reaching the house in one piece. Advancing on the ruined farm without achieving fire dominance over the occupants was what ruined them, I think I did the right thing by not deploying troops to defend it too early where they could have simply got shocked up and sniped at. Covering fire would have helped had they used it, as elites can’t be hit beyond close range by troops subject to covering fire (elites are hit on 6’s at effective range, and covering fire is -1 to hit). If the attackers had combined covering fire with tactical movement it would have slashed the effectiveness of my fire and possibly allowed them to get close enough for a local numerical advantage and extra SMGs to have evicted me. My sections were spread quite wide and while they were able to support each other by fire if he’d closed down their ability to do that he might have been able to defeat me in detail. Overall, quite a one-sided result. I felt I won due to capitalising on British mistakes rather than any particular tactical brilliance or effective manoeuvring, but I’ll take that! The Germans did take several casualties, but no hits to force morale, and all their sections were able to manoeuvre effectively at the end. If the British had fought on I probably would have charged their mashed up rifle sections and cleared them out with grenades and bayonets. Nevertheless, it was a dynamic interesting game, and everybody enjoyed themselves. 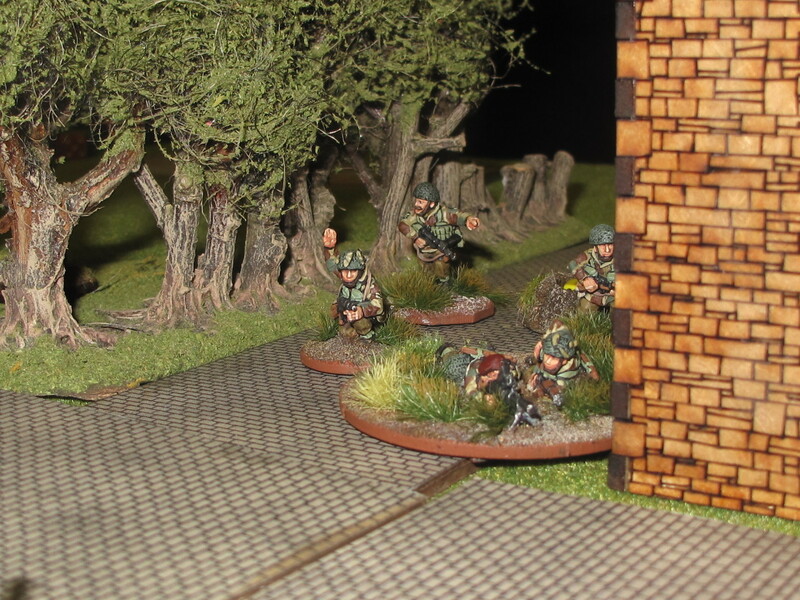 Thanks to Phil for laying on his excellent terrain and beautifully painted Paras. Wish I’d taken more photos!